Hello again, Don Milne, your ROADTRIP-'62 ™ traveler, at Columbus, Ohio. This is the first of our routes: US-23. We’re eight days out from the northern beginning point at Mackinaw City, Michigan. We’ll be heading south, using the roads of 1962, and finish the day at the Ohio River, another great transportation route of a different kind. Nearly all of today’s travel is on a divided highway, though not quite a freeway. Even as early as the late 1950s this part of US-23 needed the extra lanes. The odd thing is that it has never been improved to a full freeway and still works fairly well. There are plans to build a new I-73 along this route, however, so the future may look different. As we drive our virtual roadtrip, if you see anything you like, get out on the road and enjoy it in person. A virtual roadtrip may be fun, but there's nothing like the real thing! And, at any time, click on an underlined word below to learn more about the places on the trip. Time once again to buckle up again and go! Well, I really don’t feel like a big breakfast this morning, so I’m going to have some cereal, milk and a banana. Last night I stopped and bought some supplies after the races at Scioto Downs. Of course, I found a good 1962 cereal: Kellogg’s Frosted Flakes. These tasty, crunchy corn flakes were first introduced in 1952 as Sugar Frosted Flakes, a name they still went by in 1962. What I used to love was the little single-serving boxes you cut open on the face, now replaced by plastic bowls with a peel-off top. Tony the Tiger has been the mascot of the cereal from the beginning. The word "sugar" was removed sometime in the 1970s, during an early wave of "concern" for childrens’ health. And why do I like them? Because, they’re gr-r-reat!® The great Tony was originally designed by children's books author and illustrator Martin Provensen, but his success is mostly due to voice actor Thurl Ravenscroft. Some believe his "they’re gr-r-reat!®" is the longest running and most familiar slogan in television advertising. Mr. Ravenscroft is also well known for another 1960s audio icon: "You're a Mean One, Mr. Grinch." So after a quick breakfast at the motel, we’re on the road again, heading back into rural Ohio. Back in 1962 we would have heard the jets booming as they broke the sound barrier at nearby Lockbourne Air Force Base. It’s now Rickenbacker Air National Guard Field, renamed in 1974, and the jets are a lot less common. Rickenbacker is the home of the United States Air Force 121st Air Refueling Wing, though they are now a tenant of the civilian Rickenbacker Port Authority. When opened in 1942, it was a World War II training base and back in 1962 it was a United States Air Force Strategic Air Command (SAC) base. And the Strategic Air Command got a real workout in 1962. That year was the height of the Cold War, when the Soviet Union stationed nuclear-ready missiles in Cuba and President Kennedy gave the Soviets an ultimatum to remove them...or else. The bombers and other planes at bases like Wurtsmith and Rickenbacker stood at ready. At home, many stood ready with their fallout shelters, stocked with food and water in case of nuclear attack. It was a real, immediate fear for awhile but not today. Today we’ve been able to consolidate and even scale back the military readiness. But at least this field is still open, unlike Wurtsmith Air Force Base we passed way back in Oscoda, Michigan. 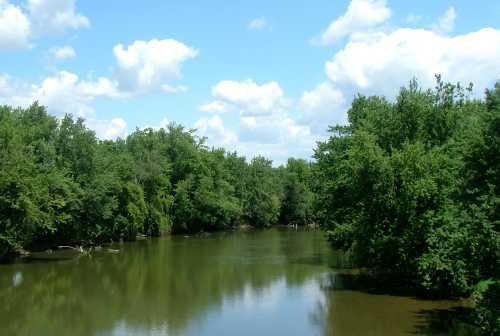 US-23 between Columbus and Portsmouth is known as the Scioto Trail, because it parallels the Scioto River. This trail ran along the Scioto River and Sandusky River valleys from Portsmouth, Ohio to Upper Sandusky, Ohio. Some sources believe it was the most traveled Native American route. In case you didn’t notice, this is the same route we have been traveling on US-23, and the route is no longer among the most traveled in the country. The river itself was also a major canoe route for the Shawnee Indians, and you can still rent canoes at Circleville, Ohio, just ahead. A stop at Shawnee Canoe Livery will get us started. They may not have been here in 1962, so you may have needed to bring your own canoe. The trip is a leisurely 4-mile run down the river, which takes about 1½ hours. It’s a broad but shallow river. The historic Ohio-Erie Canal runs parallel to the river, and it is also canoeable, and a little shorter. That’s why I’m here; because I’ve never canoed a canal before. Canal business was busy until 1856 when the first railroad was constructed through Circleville, but by 1878 traffic on the canal was about over. An old lock still remains on part of the canal west of town. Circleville itself was unique among early American towns, as it was built within existing prehistoric circular earthworks. As old drawings show, the streets radiated from an octagonal courthouse in the center of the circle. When the Ohio-Erie Canal reached Circleville, the shape of the town within the circle proved to be a problem for further expansion, and in 1838 a group of businessmen began to "square the circle". Over a 20-year period all traces of the ancient earthworks disappeared. We cross US-22 in the center of town on our way out. US-22 is one of the shorter US-numbered routes, crossing only New Jersey, Pennsylvania and ending in Ohio. I’ve worked up a good appetite with all that exercise, so I’m off to get an early lunch and some good 1962 food: we’re going down to Chillicothe, Ohio for lunch. Turning off US-23, onto Ohio-159, we pass a hint of things to come this afternoon. The Hopeton Earthworks are a fine example of the work of the Hopewell people. These structures have been degraded by erosion and farming and are only visible from the air. The site ranks among the largest of the Hopewellian earthwork centers but we will see better later today. For now it’s lunchtime at Sumburger! Sumburger is one of the few original 1950's drive-ins left, and maybe the only one along US-23 (back when it opened, this street was US-23). You can order either from your car by carport speaker or inside by phones at the booths. Sumburger has gone by several names. It opened in 1953 as the Trailer Drive-In, on the south side of town. It was relocated to this site and then called Logan View Drive-In, which it was known as in 1962. The name Sumburger wasn’t adopted until 1974. A look at the menu and I’m hard-pressed to decide among all the delicious sounding items, but I’m going to try something different: the deep-fried pork tenderloin sandwich. And served as a platter I get two sides, so the cole slaw and onion rings are coming too. I’ve had the butterscotch malted before and you really can taste the malt. And of course, I have to eat in the car for the curbside service under the carport! After lunch, I’m going to the Hopewell Culture National Historical Park. There’s a shortcut using the US-35 freeway, but that wasn’t here in 1962, so we’ll drive right into downtown and turn right on US-50. US-35 is another rather short highway, running only through Indiana and Ohio before ending just south of the Ohio boarder in West Virginia. On the other hand, US-50 almost reaches coast to coast. It did so in 1962. It is also known by another name, The Loneliest Road in America. Nevada is proud enough of this distinction to have created special route markers along their portion of the road. A lot has been written about US-50. You can look it up in a Time Magazine article of July 7, 1997, the book "US 50, Coast to Coast" by Wulf Berg and a book I’ve read, "Highway 50: Ain't That America", by Jim Lilliefors. Hopewell Culture National Historical Park is located 2 miles back north of town on Ohio-104. Mounds all around the Ohio River Valley were built by the ancient Native Americans. These earthen structures of various shapes were often built in geometric patterns. Evidence suggests that these Hopewell earthworks were used between 200 BC to AD 500. There are five separate units within the park representing some of the finest examples of Hopewellian resources. We’re visiting the Mound City Group. This group consists of 24 burial mounds framed by a large earthen enclosure shaped like a square with rounded corners. The site was declared a National Monument in 1923, so it was open during 1962. 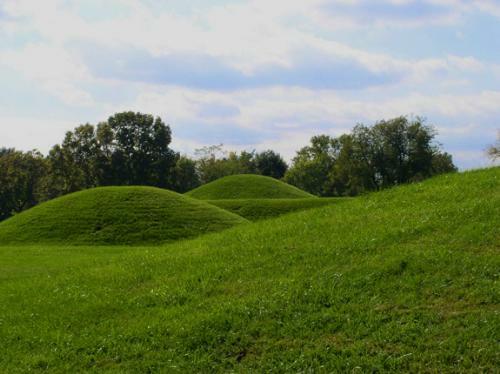 The park includes a visitor center with very good explanatory exhibits and a 17-minute film, a self-guided interpretive trail of the mounds, and another trail that circles the outer perimeter of these earthworks. Other trails to other nearby mound sites and parts of the park are under construction, so you will be able to wander all about this part of Ohio in the future. To get another view of the history of southern Ohio, visit the Ross County Museum. This is a history museum with some history, as it was founded in 1896. Yes, this area has been settled for so long that it already had a history museum in 1896! And, because Chillicothe was briefly the capital of Ohio, the Hopewell Culture had significant settlements here, and a canal was built here before the railroads, there is more history here to tell about than in many other places. The museum is just 2 blocks off US-50 when we get back to town. The museum includes information on the Civil War years in Ross County, historical toys and dolls, early Ohio decorative arts, and historical art portraits. They even maintain the Knoles Log House on the grounds, though it was not here in 1962 (it’s actually been moved twice to get here). And before I leave town, I’m buying a copy of the local news, the Chillicothe Gazette. It was not only here in 1962, it was here in 1800 and is the oldest continuously published newspaper west of the Appalachian Mountains. One can only take so much history in a day, otherwise I’d stop at the Adena Mansion & Gardens. This is the mains of the estate of Thomas Worthington, sixth governor of Ohio. The mansion house was completed in 1807 and has been restored to look much as it did when the Worthingtons lived there. It includes many original furnishings of the Worthington family, so you can really see how the well-to-do of the time lived. Adena is one of only three houses designed by Benjamin Henry Latrobe still standing in the U.S. Latrobe served as architect of the US capitol under President Thomas Jefferson. The site also includes a restored formal gardens. A good plan to visit would be to choose either this or the museum we just saw. I already made my choice, so we leave Adena for another day. South out of Chillicothe we rejoin modern day US-23. It then leaves the Scioto River valley for a while, passing over a ridge where Scioto Trail State Forest and State Park are located. This is our first glimpse of the type of lands we’ll be crossing for a few days: rugged ridgetops and wooded valleys. We’ll be traveling through these rolling stands of oak and hickory instead of flat farm country. This is an area the Ice Age glaciers of the north never reached. During World War I, the Scioto Trail State Forest was an artillery range. The purchase of land for the state forest was mostly completed by 1937, and has been left to wilderness pretty much since. There are miles of trails now, and I’m going to hike up to DeBord Vista, to get a sense of the remoteness of the area. There’s a small parking area on the main road in, and the hike climbs immediately up a 1000-foot ridge. At the top, you look out over the valley of Indian Creek. Back at the bottom, I’ll walk around the dammed Stewart Lake for a different view before we leave the area. Back on the road, we pass another Mail Pouch barn on our way south, smaller than the one back north of Delaware. Maybe these aren’t as rare as I’ve been lead to believe. Further south, as we return to the river valley, we pass Lake White State Park. This is a small park on a former Ohio-Erie Canal reservoir, and I’m not stopping today. I camped here overnight when I was younger; when I still camped. It’s been a state park since 1949, so it could be a stop on our route, but we already did one state park today. The highway that goes by the park, OH-104, has portions that were built along the former canal towpath. As we pass Piketon, Ohio, you can see the old Portsmouth Gaseous Diffusion Plant. This was a U.S. government nuclear facility that began operations in 1954. It used to process highly enriched uranium to fuel military reactors and nuclear weapons production. It was later switched to production of low-enriched uranium to fuel commercial nuclear power plants around the world. While it was in operation during 1962, in May 2001 it ended uranium enrichment operations. I don’t know if there was any public display or tour available in 1962, but those type of things were common then. The government loved to tell the story of safe uses of atomic energy, to counteract the fear of the bomb and science fiction movies. Instead of the constant security worries of today, we used to brag about our technology and show it off. Since 2001 the plant is used only for uranium storage and decontaminating uranium feed material for the Department of Energy. It also recently housed American Centrifuge's Demonstration Facility and construction now has begun on the future American Centrifuge Plant, taking the facility back to its origins in enriching uranium. And we finally reach Portsmouth, Ohio, the end of our day and the boyhood hometown of Roy Rogers. For any of you too young to remember, Roy Rogers was the model of the singing cowboy of the 1950’s and 1960’s. He was born Leonard Slye in Cincinnati in 1911 and began singing in the early 1930’s when his family moved to Los Angeles, California. In between, he grew up on a farm in the Portsmouth area. When fame finally hit, he ended up in movies, with merchandising deals, and finally on television. In 1962 we could have watched him on television, either in his show or one of his over 80 movies. Today we can see The Roy Rogers Hometown Memorabilia Exhibit, in the basement of the Portsmouth Post Office, rent or buy a DVD. A perfect one is "Roy Rogers: King of The Cowboys", with ten episodes of his TV show. The best thing to see in Portsmouth though, is something that was not here in 1962, the floodwall murals. Back in 1962 this was just a concrete wall: the oldest murals are from 1993. But we can cheat a little, because some of the murals depict buildings present in 1962, such as in downtown and the shoe industry, and also Roy Rogers and a view of downtown with the old U. S. Grant Bridge (replaced in 2006). The murals, kind of giant postcards, give a detailed pictorial history of Portsmouth and its citizens and are spectacular! The murals grace the 20-foot high floodwall, originally built around 1950, for almost a half mile along Front Street. They were created between 1993 and 2002 by internationally renowned muralist Robert Dafford and assistants. The most striking feature of many of the murals is the 3-D effect: they look as though you are looking through windows, past columns, or other framings. I enjoy driving past them in both directions, to see everything to best advantage, but walking by would actually give you more time to admire them. Afterwards, I’m going head a few blocks east to Cora’s Big Top Malt Shop, on US-52, grab a nice big malt. In Portsmouth we cross US-52, the first route we’ve crossed that goes to Canada. And, after dinner when it gets dark, I might try a little bowling to end the day. Bowling was a much more popular pastime in 1962 than it is today. Bowling alleys were still being built in many cities. There are three out near the east end of town, all on or near US-52. Rainbow Lanes has been here since 1962, and one of the other may also have been. So let’s go bowl a few frames, drink a few beers, and have some fun. Then I’ll find a motel for the night, though it doesn’t look like I’ll find an old one.